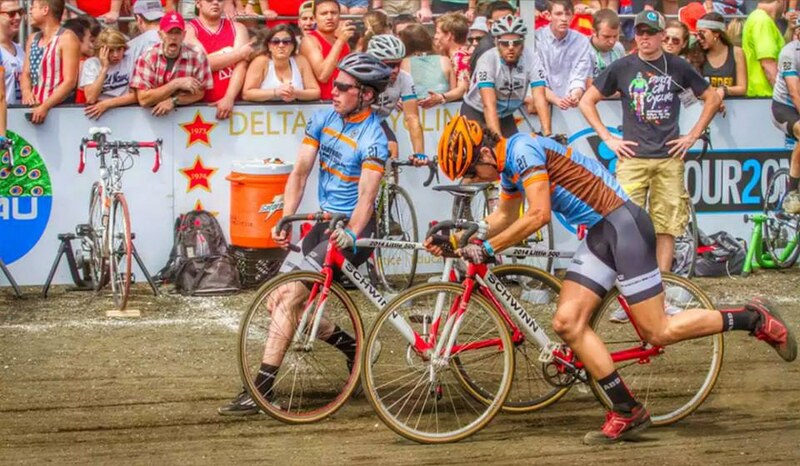 Five riders discuss Little 500 preparation, challenges and being part of their teams. Madison Borgmann played competitive sports in high school. 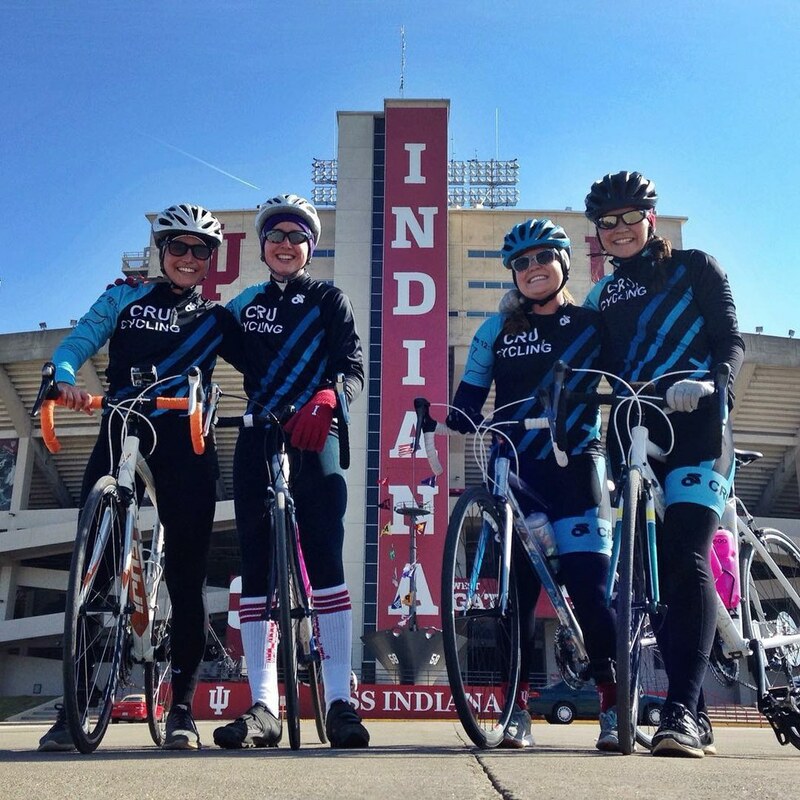 During her sophomore year at IU, she joined a new team - Delta Gamma Cycling. "It was nice to be on a team again," she said. Borgmann, now a senior, is riding in her third Little 500 race this year. For her, and so many Little 500 riders, biking is a hobby, a passion. Training takes place year-round, but these days her team is focused on being comfortable on the track, working on sprints, distance and exchanges. "That's usually what this time of year is meant for," she said. 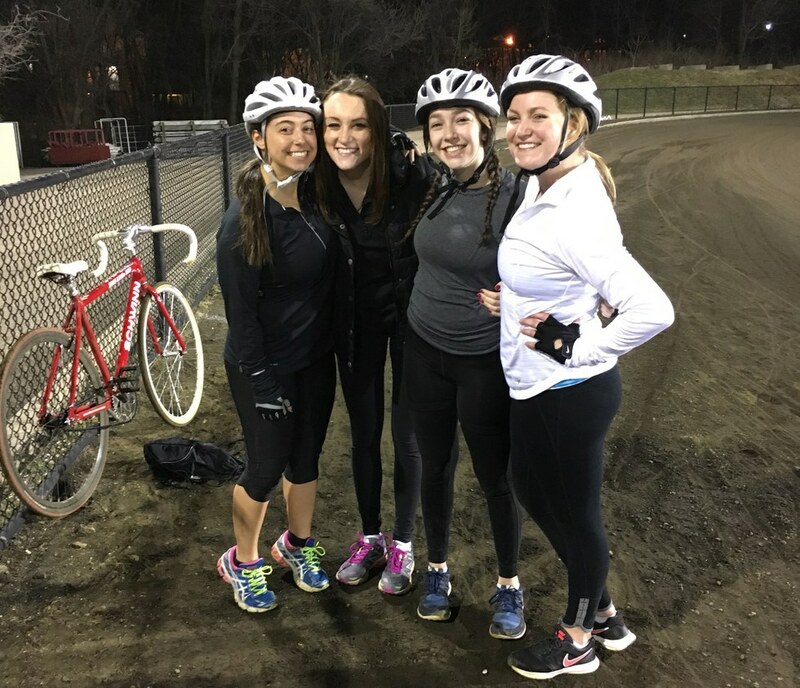 During the week leading up to qualification day on March 26, smooth and fast bike exchanges on the track were a major focus for Sigma Delta Tau, team member Kelsey Bardach said. Although Bardach trained for Little 500 last year, this year will be her first riding in the race. "I thought it was such a cool opportunity when my sorority presented it to us as new members," she said. "I knew I wanted to be able to represent my chapter in such a unique event." The 2016 Sigma Delta Tau Little 500 team. Photo courtesy of Kelsey Bardach. SDT finished 30th last year and qualified 32nd for this year's race. Shay Britzke, a rookie member of the Cru Little 500 team, said her training off the track includes riding on rollers, cross-training and doing ab workouts. With a strengthened core, she said, it's easier to stay steady on the bike. Track practice begins with a few warm-up laps. Afterward, Britzke said she and her team say a quick prayer - a prayer for safety and good communication, for their team and for the others. Cru is a Christian ministry on campus; a verse from the book of Hebrews is printed on the riders' jerseys. "We are riding not only for our own glory but for the glory of God," she said. Just four years after having its first women's team, Cru finished third in the 2015 race. This year, the team qualified 12th. The 2016 Cru Cycling team. Photo courtesy of Shay Britzke. Britzke said preparing for Little 500 also means eating smart. She eats iron and protein-rich foods like spinach, eggs, pesto and chicken, as well as plenty of fruits, vegetables and Cliff bars. Foods like these, she said, allow her to perform at her best and benefit the team. "It's really not that difficult to fuel my body in that way," she said. "It's just something I know needs to be done." Daniel Koch of Phi Kappa Sigma said he also eats a lot of protein and cuts back on the sugar and desserts. "I personally do a lot of peanut butter," he said. Bardach said she simply tries to eat healthy as much as possible. "But in my eyes, that's just not eating ice cream as much!" she said. For James Welch of Gray Goat Cycling, the most challenging part of Little 500 is finding the time and motivation to train, especially in the winter. During that time of year, Welch said his training involves indoor interval workouts and weightlifting. "Riding inside every day is not the most enjoyable," he said. Another challenge for an independent team, Welch said, is finding recruits. Gray Goat began in 2008 when a group of men who worked at Gray Goat Sports in Indianapolis decided to form their own Little 500 team. Welch said the team once recruited a member at a Steak N' Shake at 2 a.m. after talking with someone interested in riding bikes. Gray Goat finished 12th in the 2015 race and qualified sixth for 2016. Welch said the team's goal was first to get into the race, then put in the work to win. "That’s the goal for everyone I think, he said, "to get the win at the end of the day." Gray Goat cycling during an exchange in the 2014 men's Little 500 race. Photo courtesy of James Welch. Delta Gamma finished fifth last year and qualified third for the 2016 race. Borgmann said all of the riders are returners, so now training is just a matter of tightening up loose ends. "It's not as scary and new," she said. Borgmann said her favorite part of Little 500 is the camaraderie of her team. "They're my four best friends, and I wouldn't have met them without Little Five," she said. Koch said his favorite part of Little 500 is race day, when people are finally in Bill Armstrong Stadium, screaming and chanting for their riders. Phi Kappa Sigma, also known as Skulls, finished ninth last year - the team's first-ever top 10 finish - and qualified 20th this year. Koch said Quals is especially crazy - it's hectic, and riders can feel the nerves when they walk up to begin their qualifying four-lap sprint, no matter what time of the day they go. But coming out of turn four and seeing the crowd cheering on your organization, Koch said, is a "one-of-a-kind experience." "It's just really cool to have people see what you’ve been working on so long," he said of race day. "It’s the most exhilarating feeling I've had, at least in my college experience." Full Little 500 2016 qualification results can be found on the IUSF website.